Approx. 900 sq. ft. of living space 10’ ceilings, Exposed Brick Walls, Inlaid Hardwood Floors, Tin Ceilings with Oversized Crown Moldings, Tin Wall Coverings with Stained Hardwood Trim, 2 Decorative Fireplaces w/ Mantles. 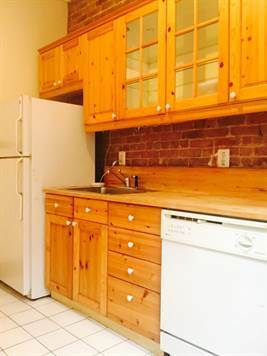 Large Eat-In Kitchen w/ Dishwasher.